Deal hunters can find a new Sony Xperia XZ smartphone for $220 below the original retail price. 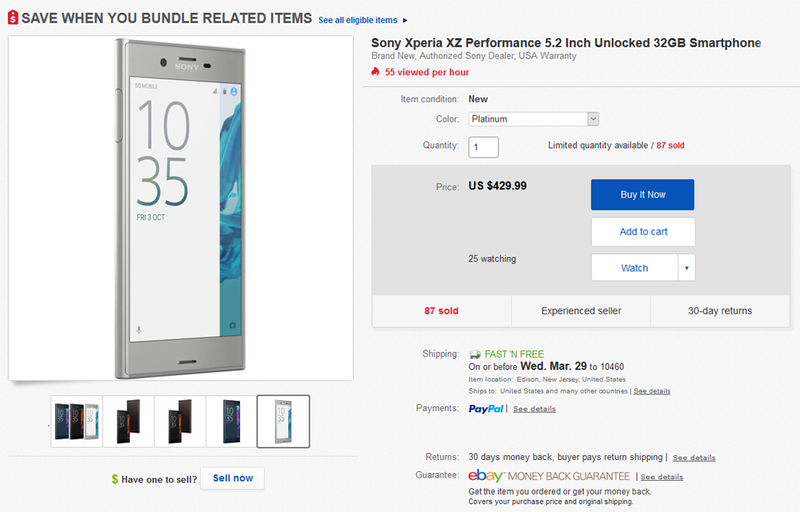 Currently, you can pick up the Sony handset over on eBay for $430. The listing also includes the manufacturer’s warranty for the United States. You can pick up one of these in either black, blue, or platinum variants. They are sold unlocked and will only be compatible with GSM carriers in the US like T-Mobile and AT&T. Note that the device will not work on CDMA networks like Verizon or Sprint. The Xperia XZ was released just in time to redeem Sony of its new Xperia X smartphone lineup, which initially received its fair share of backlash due to some of the choices made by the manufacture like the removal of water-resistance and the inferior chipsets. The XZ is powered by a Snapdragon 820 CPU paired with 3GB of RAM. There’s also a 5.2-inch display and a 2,900 mAh battery. The XZ is the first smartphone to feature five-axis image stabilization and it pairs nicely with the 23MP camera. Just remember the US model has no fingerprint scanner in the power button.